BOSTON – People living with diabetes have filed a groundbreaking class-action lawsuit against the three makers of analog insulin drug products – Sanofi, Novo Nordisk and Eli Lilly – for exponentially raising consumer insulin prices in an organized scheme to drive up prices at the expense of patients who need insulin drugs to live, according to Hagens Berman. The lawsuit states that in the last five years alone, Sanofi, Novo Nordisk and Eli Lilly have raised the sticker or “benchmark” prices on their drugs by more than 150 percent. Some plaintiffs now pay almost $900 dollars per month just to obtain the drugs they need, according to the firm. This first-of-its-kind lawsuit details several accounts from patients resorting to extreme measures to survive rising insulin prices, including starving themselves to control their blood sugars, under-dosing their insulin, and taking expired insulin. Other class members have intentionally allowed themselves to slip into diabetic ketoacidosis – a potentially fatal blood syndrome caused by lack of insulin in the body – so that they can obtain insulin samples from hospital emergency rooms. “People living with diabetes are practically imprisoned under the price hikes and sadly are resorting to extreme measures to afford the medication they need to live,” said Steve Berman, managing partner of Hagens Berman, which represents the patients. According to the lawsuit, filed Jan. 30, 2017, in the U.S. District Court for the District of Massachusetts, the three companies have exploited the drug-pricing system in a way that ensures higher profits for drug manufacturers and other players, leaving those living with diabetes crippled by high insulin costs. These acts, says the lawsuit, constitute a RICO enterprise, and violate the Racketeer Influenced and Corrupt Organizations Act and various state consumer protection laws. 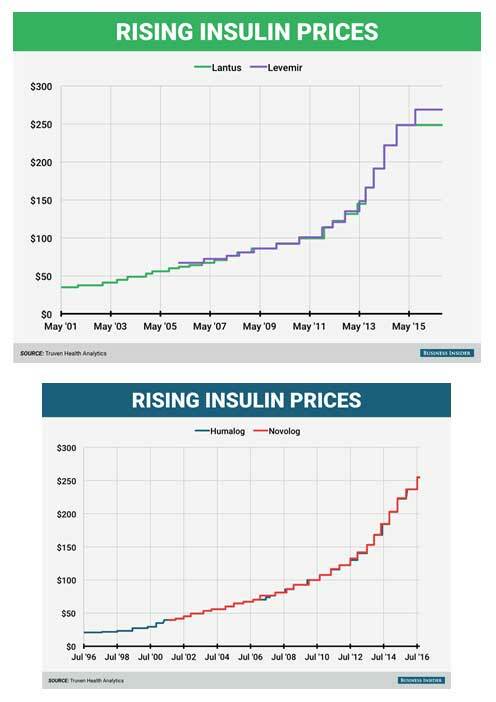 The manufacturers of insulin even admit that their price hikes are unrelated to any jump in production or research and development costs, the suit explains. The most important of these bulk drug distributors are entities known as pharmacy benefit managers (PBMs). These entities serve as middlemen between health insurers and drug manufacturers, negotiating medicine prices with drug companies on behalf of health insurers. The PBMs also design drug formularies for their health insurer clients, ranking drugs based on efficacy and cost, the suit states. These formularies allow health insurers to funnel patients towards one brand of drug over others. Because the analog insulin products of the big three insulin manufacturers are largely interchangeable, these drugs companies fight for preferential placement on the PBMs’ formularies, offering PBMs “rebates” off their benchmark prices, according to the complaint. The lawsuit explains that as compensation for their role as negotiator, PBMs pocket a percentage of the difference between the reported benchmark price and the undisclosed real price they are able to secure. This difference in prices is known as the “spread.” The larger the spread, the higher the PBMs’ profits. “The drug manufacturer with the largest spread between benchmark and real price is more likely to secure a PBM’s preferred formulary position, and, as a result, the business of that PBM’s clients,” the suit states. “Where two or more drug manufacturers make largely interchangeable products, those companies would, in an ideal world, continuously drop their real prices to undercut the prices offered by their competitors.” But because of this two-faced public and private system, drug companies instead choose to hike their publicly reported, benchmark prices, while maintaining constant (or only slightly lowering) the real prices they offer to PBMs, the suit states. Instead of competing for PBM business based on significant real price decreases, the drug manufacturers have decided to compete based on significant benchmark price increases. The lawsuit calls this trend of one-sided price increases “an arms race,” as each of the three defendants – Sanofi, Novo Nordisk and Eli Lilly – has raised its benchmark price in “perfect lock step” with its competitors to ensure that the large PBMs keep its drug in rotation. The lawsuit alleges that in a January 2017 statement, Eli Lilly admitted to the benchmark price – a net price scheme. The figures in the lawsuit illustrate this behavior. There are two types of analog insulin: long-acting and rapid-acting. Novo Nordisk’s Levemir and Sanofi’s Lantus compete in the long-acting category, and Eli Lilly’s Humalog and Novo Nordisk’s Novolog compete in the rapid-acting category. The firm says this arms race hurt patients – the plaintiffs here – who must pay for a high percentage of their drugs out-of-pocket. Uninsured patients and patients in high-deductible health plans, plans with high coinsurance rates, and Medicare Part D plans have been seriously injured by Sanofi, Novo Nordisk and Eli Lilly’s benchmark price hikes, according to the complaint. “It is our hope that this suit not only reclaims losses for the millions of U.S. patients struggling to survive with diabetes right now, but that it also shines a spotlight on an egregious scheme perpetrated by these defendants. It’s time to break up the Insulin Racket, and that is the objective of this case,” he added. The lawsuit seeks to represent a nationwide class of consumers who have purchased analog insulin at recently skyrocketing prices, to reclaim economic losses in an amount to be determined at trial and to put in place an injunction halting this behavior. Hagens Berman Sobol Shapiro LLP is a consumer-rights class-action law firm with offices in 10 cities. The firm served as lead counsel in historic settlements involving inflated benchmark drug prices, including Average Wholesale Price MDL and a class-action lawsuit against McKesson Corp., one of the nation's largest drug wholesalers, recovering more than $500 million for plaintiffs. More about the law firm and its successes can be found at www.hbsslaw.com. Follow the firm for updates and news at @ClassActionLaw. Attorneys are currently looking for people who purchased Lantus, Levemir, Novolog, Humalog and Apidra from the following states: Alaska, Alabama, D.C., Hawaii, Minnesota, Missouri, New Hampshire, North Carolina, North Dakota, Oklahoma, Rhode Island, South Carolina, South Dakota, Virginia, West Virginia or Wyoming. Did you purchase Humalog in Arkansas, Illinois, Kentucky, Mississippi, New Mexico, Oregon, Tennessee or Vermont? Did you purchase Novolog or Levemir in Colorado, Montana, Nevada, or Washington? Did you purchase Lantus, Apidra or Toujeo in Louisiana, Maine, Mississippi, Tennessee or Washington? Hagens Berman Sobol Shapiro transferred the Insulin Class Action on behalf of patients paying high out-of-pocket costs for analog insulin to the District of New Jersey from the District of Massachusetts because there was a related case ongoing in the District of New Jersey. Efficiency concerns led us to transfer the case from the District of Massachusetts to that of New Jersey. Absent such a move it is likely the case would have been subject to an MDL petition, which would have slowed the case’s progress. James Cecchi, of Carella, Byrne, Cecchi, Olstein, Brody & Agnello, P.C., filed a related suit on behalf of an investor class against Novo Nordisk in New Jersey. James Cecchi remains as one of the lawyers in that suit. There will be a lead counsel selection process pursuant to the federal law governing securities cases in that lawsuit. Hagens Berman Sobol and Shapiro is not involved in that investor class lawsuit. Hagens Berman Sobol Shapiro is proposed lead counsel for the patient-plaintiff class. We will continue to represent only this patient class, and advocate in the best interests of this class only. As of right now, James Cecchi is local counsel for the patient-plaintiff class. However, because Hagens Berman Sobol Shapiro is lead counsel, our firm will be directing the course of this litigation. We will do so in the best interests of the patient-plaintiff class, and that class only.